Aztec society before the arrival of the Spanish conquistadors was a complex mixture of multi-ethnic groups who also spoke different languages and dialects. Although various other groups also spoke the Nahuatl language, it was the Mexica people who became dominant and laid the foundations of the Aztec Empire. Aztec society developed its own political system and sophisticated social traditions in addition to complex theology and the system of an empire. They also developed long-distance trade despite the absence of wheel and horse. The history of the Aztec society can be traced to the middle of the first millennium CE when various tribes from the north began migrating into the south. Initially, these were nothing more than hunter-gatherer tribes but with the passage of time, they developed complex societies. Eventually they developed agriculture under the classical Mesoamerican civilisations. With the establishment of different city-states, constant disputes arose between them which with the passage of time became the foundation of the Aztec empire. Aztec society before the arrival of the Spanish conquistadors was a complex mixture of multi-ethnic groups who also spoke different languages and dialects. Aztecs brought some of the cultural and theological aspects with them when they migrated from north. But they also developed and refined both these aspects at their new abode. After the establishment of the empire in 1428, one of the foremost changes in the Aztec society was its increased emphasis on martial virtues. The cultural foundations of the Aztec empire were based on the rich mythology of the Aztec religion, reverence for the rulers, and respect for family life. In the political organisation of Aztec society, the emperor was of central importance. He was also an important figure in Aztec religion and was considered to be the descendant of gods. While he enjoyed ultimate power, the political organisation was hierarchical and people could have their say through the city councils. Administrative power, however, was mainly with the nobility. Within each city-state, common people made their voice heard through “calpulli” which was a political unit composed of several families. The Family was the basic social unit of the Aztec society and one of central importance. Lineage was equally important in Aztec society since it determined the social standing of a person in society. The lineage of the nobles was traced back to the gods and it was also common to trace the kin back to various ruling dynasties of the past, in particular the Toltecs. Marriages were mainly decided by the elders of the clans and the extended family was an important social unit as well. The most important social unit in every city-state was called “calpulli”. It was composed of several inter-related families and therefore can loosely be described as a clan. A local chief was at the head of the calpulli which was mainly composed of people from his own extended family. The chief ensured that his extended family paid the required tribute and in turn provided them with land for agriculture and other trade opportunities. Members of the calpulli also actively took part in Aztec trade and commerce. The term Aztecs used for their city-states was altepetl. It meant a separate city-state consisting of several calpullis and being ruled by a ruler called tlatoani. In case of city-states subjugated by the capital city of Aztec Empire, the local rulers were generally reinstated if they paid the tribute and were not belligerent. The tlatoani was from the nobility and the head of the most influential calpulli. The world “altepetl” not only referred to a certain area but also its population. The autonomous city-states were constantly at war with each other in order to establish their hegemony. Thus the weaker city-state would be dominated by the more powerful state and would have to pay tribute to them. This resulted in the formation of alliances between different city-states. Before the Aztec empire was established, the city of Tenochtitlan formed a political alliance known as “The Triple Alliance” with the cities of Tlacopan and Texcoco. This alliance of the Aztec society became a forerunner of the Aztec Empire. Aztec society was a class society and thus it was divided into various social classes. Broadly speaking, this included the nobility, the commoners, and the slaves. The nobility of the Aztec society consisted of the landed classes, the priests, and the warriors. The commoners, on the other hand, consisted of the common people from all other trades. Travelling traders enjoyed better status than the common people. Finally, the status of the slaves was at the lowest degree, although they could marry and were free to have children. 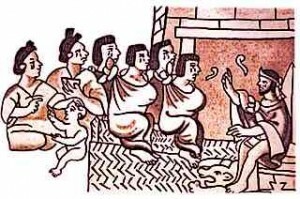 A proper system of education existed in the Aztec society with education being compulsory for all Aztecs. The schools made mainly for the children of the common people were called “telpochcalli” where they were given basic military training and taught history and religion. Children from the nobility, on the other hand, went to schools called “calmecac” where the sphere of taught subjects was much broader and included administrative and literary studies. 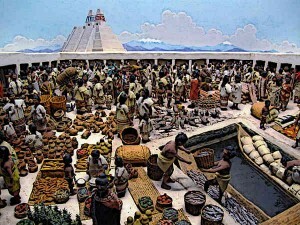 Trade and commerce was central in Aztec society and each city-state in the empire had its central marketplace in addition to other smaller marketplaces. The travelling traders constantly moved between different city-states, exchanging goods and news. Some of these traders worked exclusively for the nobility. Prices of goods were closely monitored and regulated by government officials. Although the most important profession in Aztec society was that of warriors, they indulged in agriculture as well. In the valleys, they used irrigation farming and made small dams in order to divert water from natural springs to fields. While the irrigation system for agriculture was in place before the Aztecs, they constructed an elaborate canal system which was much better than the previous systems. Aztec society was a mixture of people from different ethnicities dominated by the Mexica people who had their capital at the city-state of Tenochtitlan. Aztec society was divided into various classes, each having its rights and responsibilities. Education was compulsory for all children above a certain age. The city-states in the empire had their own rulers while the administration was run by the city-councils.